#2-56 x 3/8-inch pan head Phillips SEMS screw with internal-tooth lock washer. Zinc plated steel, machine thread. Commonly used for small microswitch mounting on most makes/models of games. Replaces Bally/Williams #s 4002-01105-06 and 4002-01005-06 (non-SEMS). Use this screw if mounting a microswitch to a pre-threaded mounting bracket. 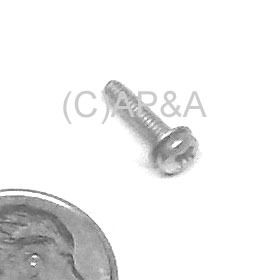 If mounting THROUGH a bracket and into a screw plate, use the longer 1/2-inch version of this screw instead.